The whole line of Nu Skin’s Tru Face products was presented in the latest edition of Danish magazine Sportsfan. The product line has been described as the latest technology for skin care, to be used by both him and her. ageLOC Edition Nu Skin Galvanic Spa System II is recommended as one of the six best creams to banish wrinkles. Nu Skin´s ageLOC Edition Nu Skin Galvanic Spa System II is featured in an article about anti-ageing. ReNu Hair Mask was tested and reviewed by Amina magazine. Our very own Gemma Sheppard is featured on the cover of the latest edition of lifestyle magazine Women. Inside the magazine, Gemma talks about her career, fashion and of course Nu Skin products, which she swears by to keep her skin fresh and dewy. Introversion recommends Nu Skin 180º to restore hydration and luminosity to your skin. Especially after long, torrid summer months. ageLOC Galvanic Body Trio was tested and approved by Fairways magazine. Sunright® SPF 35 is featured in the sun protection compilation and the Enhancer is recommended as a post sun product. NaPCA Moisture Mist is recommended for cooling summer hydration. A rather interesting, moreover useful article was published on the topic how to sunbath properly. There are two product tips; both of them are related to Nu Skin: Sunright® SPF 35 and Sunright® lip Balm. ageLOC Body Trio and ageLOC Edition Nu Skin Galvanic Spa System II were tested by Lourens magazine. Sunright Lip Balm has been featured in an article about sun protectors. The popular Hungarian beauty blog MakeUp.blog.hu is currently testing Nu Skin® products: Nu Skin 180°® AHA Facial Peel and Neutralizer; Moisture Restore Day SPF 15 Normal to Dry Skin; Epoch® Baobab Body Butter and AP-24® Oral Care Collection. R2 is featured in the Novelties and ageLOC® Galvanic Body Trio in the Beauty Section. ageLOC® Dermatics Effects is featured in the editorial among the effective creams and body lotions against cellulite. Shape features a R2 advertisement and the ageLOC® Edition Nu Skin Galvanic Spa System® II is mentioned in an article as well. A short advertorial about R2 is published. And Exfoliant Scrub, Polishing Peel and Creamy Hydrating Masque are selected in the Shopping Zone. The Norwegian fashion and beauty magazine KK, featured Nu Colour Bronzing Pearls in a recommendation on products for a sun kissed skin. Sole Solution was also featured in an article on how to get your feet ready for this summer. ageLOC Body Trio is featured as a simple and efficient spa treatment to use at home in the April edition of Style Magazine. The Czech online magazine for women recommends ageLOC Transforming Night as one of the „12 night creams that really work“, stressing the role of the product in the fight against skin ageing. This exclusive magazine dedicated to luxury, fashion and travel includes Nu Skin's Galvanic Spa devices in its beauty section. ageLOC Body Trio has been featured on the French blog monkeyseemonkeydo.fr. The ageLOC ® Edition Nu Skin Galvanic Spa System® II and Facial Gels are mentioned in an article with suggestions on how to maintain a strong and radiant body, in the March edition of Norwegian magazine KK. LifePak®+ is featured with it benefits and Celltrex® CoQ10 Complete is selected in another section of the same issue. The ageLOC Edition Nu Skin Galvanic Spa System II has been featured in an article about beauty, health and welfare products. The ageLOC ® Edition Nu Skin Galvanic Spa System® II and Facial Gels were mentioned in a review on beauty favorites in the February edition of Norwegian magazine Woman. Nu Skin's 180 Anti-aging system was featured under luxury facial moisturizer in the danish magasine Sportsfan. An article about Epoch Baobab Body Butter on the French blog Geribook.com. 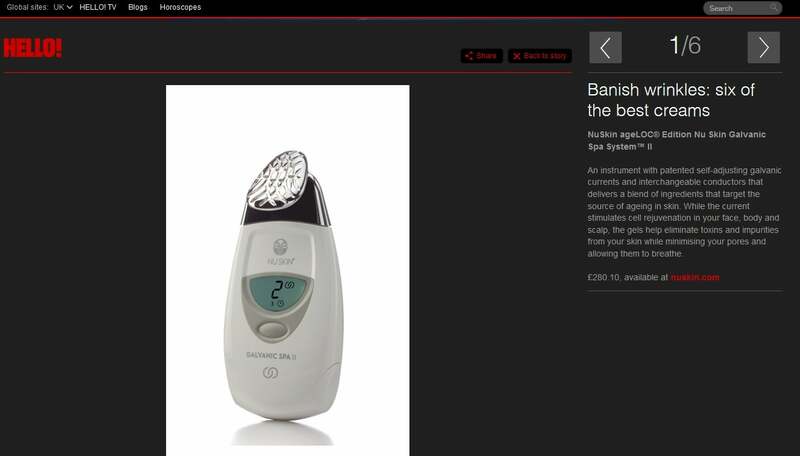 Galvanic Body Spa is featured in the Top Ten of cosmetic instruments. 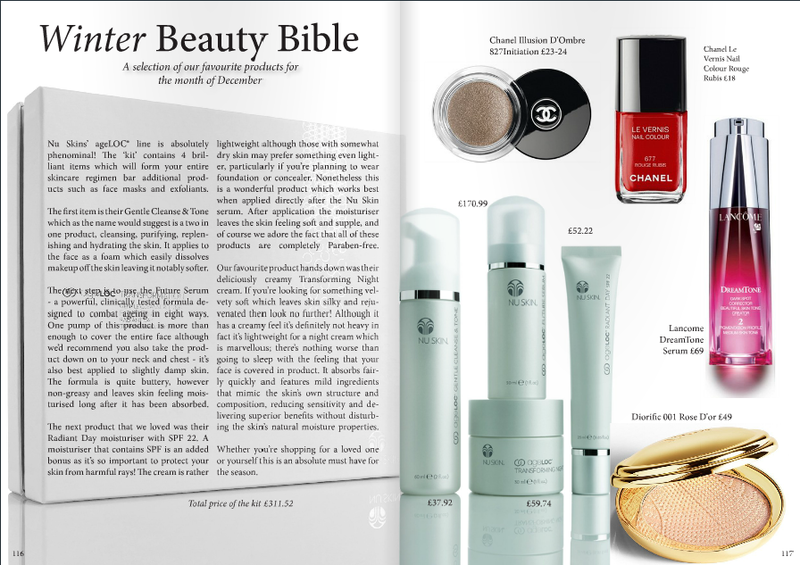 Nu Skin Clear Action® System and g3 are featured in two different sections of the magazine. Epoch Baobab Body Butter has been featured in an article about body balms for the winter. The bulletin of the Spanish Direct Selling Association includes information about Joe Chang's Golden Bridge award as Most Innovative Person of the year..
Night Supply Nourishing Cream has been reviewed on the French blog Beauté addict.com. The ageLOC Transformation kit was on the top 15 Paraben free beauty Product list in the british online magasine Insignia. An article about ageLOC Dermatic Effects on the French blog LeMondeeco.fr. Epoch Baobab Body Butter is featured in an article about beauty tips for the winter. Epoch Baobab Body Butter is featured in an article about health and beauty: “taking care of yourself”..
Prozeny.cz online site recommends Rejuvenating Cream, Epoch® Baobab Body Butter and Perennial Intense Body Moisturizer; including a quote from Bálint Balla, Product Specialist Eastern Europe. Our Moisturizing Shampoo is recommended for dry hair on lesk.sk. An article called “Re-surface skin” recommends the ageLOC Edition Nu Skin Galvanic Spa System II and describes how they were impressed with how much it improved the look of the skin. Epoch Baobab Body Butter was tested and approved by Fairways magazine. Clear Action was selected as one of the best treatments of the moment to minimise current breakouts. An article about the Nu Skin Hair Care line. NaPCA Moisture Mist has been selected as one of the 25 must haves to repare your hair. 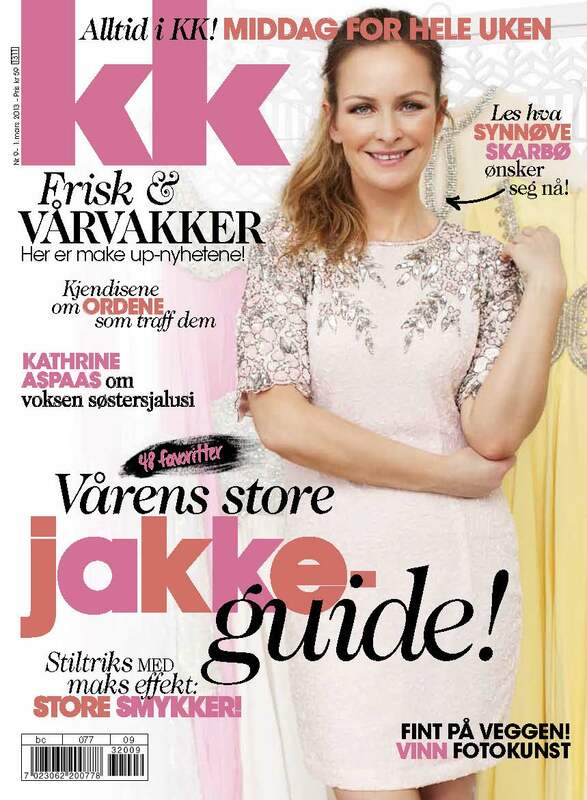 ageLOC® Edition Nu Skin Galvanic Spa System® II comes out on top in the Norwegian fashion magazine Tara! The instrument gets 6 out of 6 stars and is graded as absolute star quality. LifePak+ has been featured in an article about food supplements. The bulletin of the Spanish Direct Selling Association includes an article about Nu Skin being named highest revenue company by Utah Valley Business Q magazine. The beauty blog From Madrid With Blush reviews the Clear Action System. Epoch Baobab Body Butter was tested and reviewed by Amina magazine. Nu Skin accreditations were featured in an article on a well-known business online site. An article mentions the Nu Skin advantages and how we demonstrate our difference. ageLOC Radiant Day was tested and approved by Fairways magazine. ageLOC® Dermatic Effects and Sunright® Lip Balm SPF 15 are recommended in the editor’s choice section. ageLOC® Dermatic Effects is recommended among the best product for toned skin. The most important facts and figures about Nu Skin are featured on this popular website. Besides a beautiful R2 advertisement (in the magazine’s Top Secret column) actress, Anikó Für shares her beauty secrets with the readers. She mentions NaPCA Moisture Mist among her favourite beauty products and she even talks about her at-home galvanic treatment. The article gives advice on how to conrol your health in the stress of modern civilization. The solution is R2 – a product that respects the natural biorythm of the human body. ageLOC Body Trio was tested by Knack Weekend and is featured in an article about firming body products. ageLOC Body Trio was tested by Feeling and is featured in an article about spa at home. Tru Face® Instant Line Corrector is recommended. Transformation Kit is review as a problem solver in the beauty section of the Danish magazine Hendes Verden. An article about the ageLOC Edition Nu Skin Galvanic Spa System II. The beauty blog "MIS TRUCOS DE BELLEZA" reviews the ageLOC Transformation System. ageLOC Body Trio was tested by Amina Magazine. The tourist guide magazine, which is available in hotels, tourist and business centers and airports for free, featured a short article about the Budapest Walk-in Center and our great products in the Wellness section. The back cover of the magazine announces R2 coming in April and LifePak®+ is featured among the novelties. 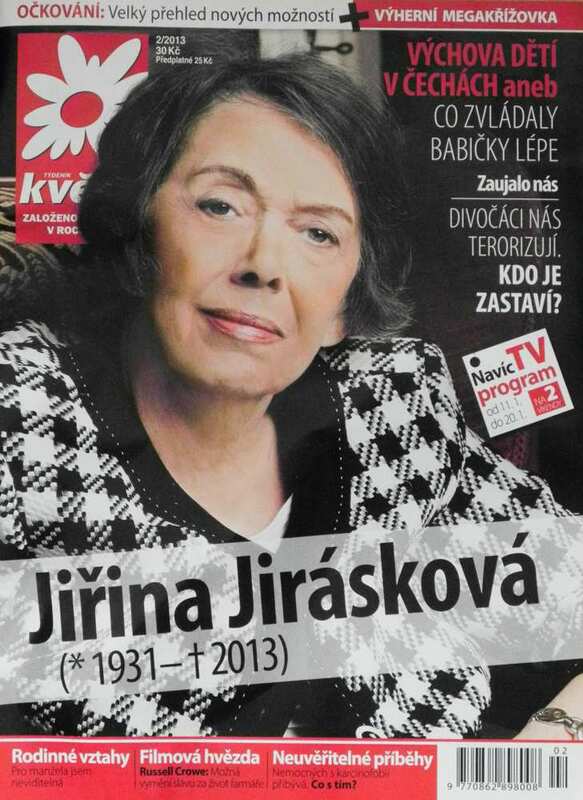 The Czech weekly magazine stressed the benefits of our Rejuvenating Cream in the winter season. Rejuvenating Cream is recommended by the beauty editor of Éva magazine as a great moisturizer for dry skin in the winter time. LifePak+ is featured in the norwegian magasine Costume's beauty editors favorites. Epoch Baobab Body Butter has been featured in an article about a 5 days anti cold program. ageLOC Dermatic Effects has been tested by the French blog Mum magazine. An article about Nu Skin 180° Cell Renewal Fluid on the French blog monkeyseemonkeydo.fr. 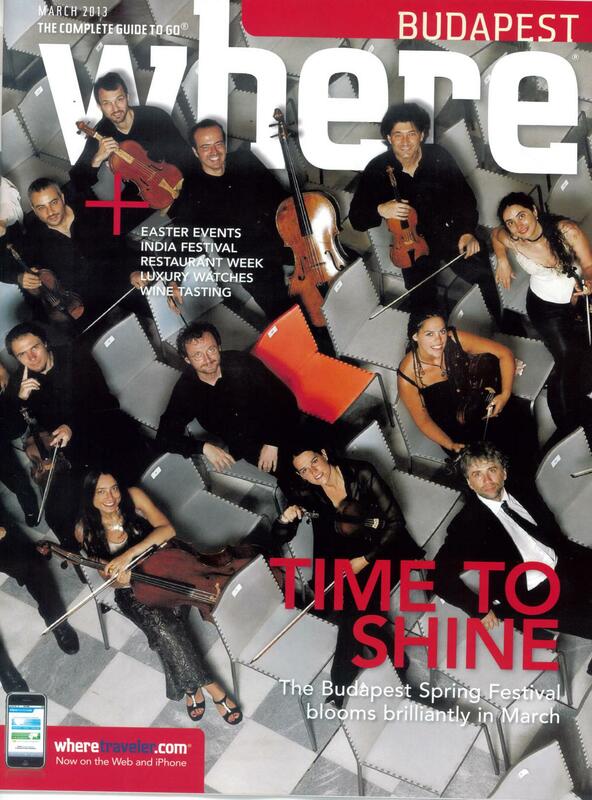 The first MLM Year book introduces the most important MLM companies in Hungary. Nu Skin® is featured in a 4-page long article with the most important facts and information to know about us. 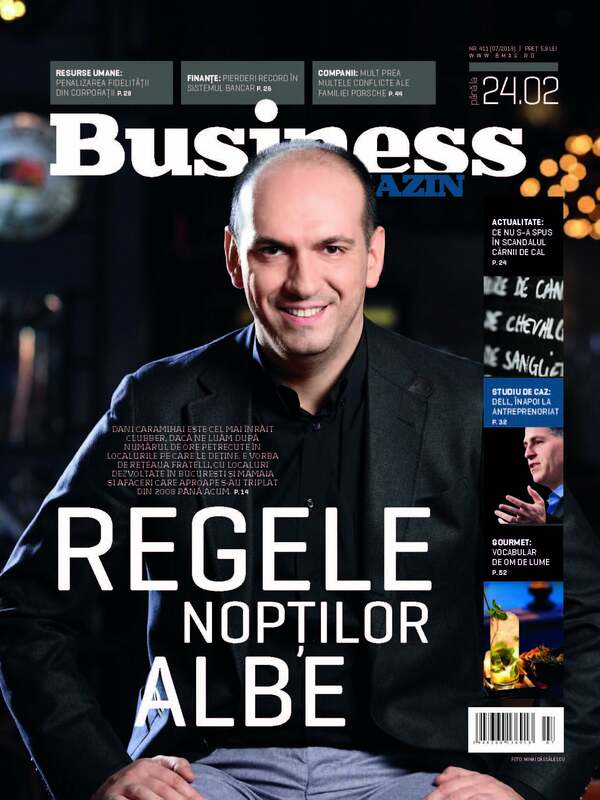 Business Magazin features an article about the six basic principles how Nu Skin demonstrates the difference. Epoch Baobab Body Butter has been featured in an article about body lotions for the whole family on the French blog Ma Famille Zen.com. An article about Epoch Baobab Body Butter on the French blog Inform'Elle. ageLOC Galvanic Body Trio is featured in the product news. 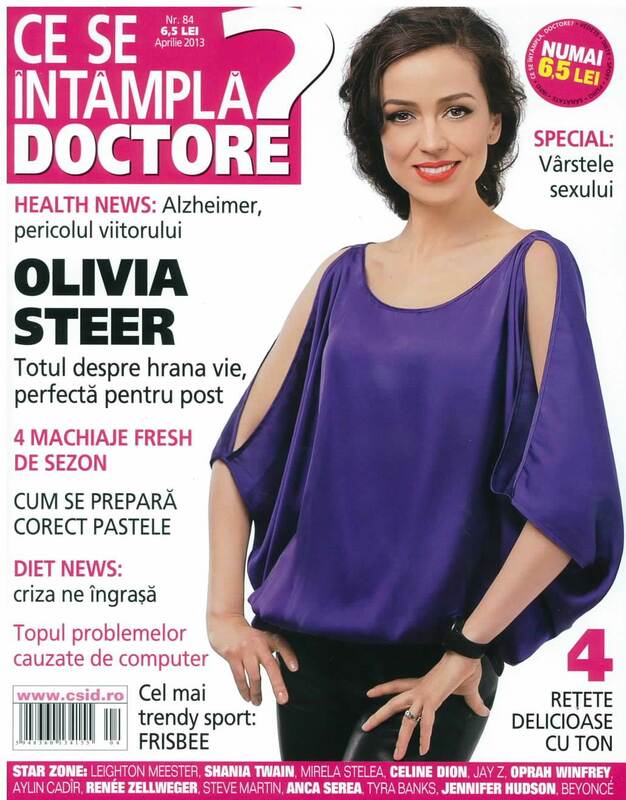 ageLOC® Future Serum is featured in the 5th week issue of Nők Lapja in the article “Youth elixirs” magazine in Hungary.